Gabriel Fauré is well known for relatively few pieces. Flautists all know his Fantasie, as well as sharing his Sicilienne with cellists and others, choral music fans will know his beautiful Requiem,and of his piano music the four-handed Dolly Suite is instantly recognisable. His solo piano music isn’t quite as frequently heard, though there have been numerous recordings, including by notable artists such as Pascal Rogé for Decca. Angela Hewitt’s selection here is unashamedly of her favourite pieces by Fauré, and a very fine programme it makes indeed. Superbly recorded in the fine acoustic of Berlin’s Jesus-Christus-Kirche, Hewitt’s preferred Fazioli instrument sounds stunning. The choice of Fauré may have something to do with Hewitt’s teacher Jean-Paul Sevilla’s liking for the composer (see review), but comparing to Rogé and someone like Sally Pinkas, it is clear where the distinctions lie. 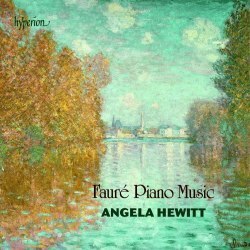 Hewitt can’t help sounding a little less French than Pascal Rogé, but her warmth of tone, harmonic voicing and lyricism combine to give Fauré’s Nocturnes a poetry you will rarely find expressed quite as eloquently as here. The shorter, but still substantial works on this programme are framed by a pair of longer masterpieces. The Thème et variations is an inspired work, the inner voices, sturdy bass lines, rhythmic variety and intriguing harmonic progression around which the theme is based all make for a piece which can be relished in much the way you might the best of Brahms. If you didn’t know this piece before, Angela Hewitt will have you looking at Fauré with different eyes by the end. The final Ballade is an earlier work which opens in an amiable salon style, but soon teases our ears with elusive harmonic close-cornering which sounds like the harmonic equivalent of gender-bending: feminine textures with backward glances from a Mr Hyde somewhere in the character of the music. Wagnerian influences and Fauré’s encounters with Liszt add a tint of extra romantic richness to this piece, but its disarming lack of real bombast and those fingerprints of lyrical openness are all Fauré’s own. Shorter they may be, but the remaining works are anything but insubstantial. The Valse-caprices are filled with fun and sparkle, and Hewitt delivers pianistic fireworks as well as that sense of whirling dancers these pieces conjure so well. The Nocturnes chosen here all come from different periods of Fauré’s life. The centrally placed Nocturne No. 6 is the best known of the three, and Hewitt brings out the spiritual depth in music which carries the Requiem as part of its past. The Nocturne No. 13 was Fauré’s last piano work, and a distillation of style in the opening. This aspect and a defiance of character further on result in a surprise package which ‘has it all’. Hewitt’s clear affection for this repertoire and her skilled and utterly expressive and tasteful interpretations make this a rather special disc of some striking and fascinating piano music. Comparable with the Monet paintwork for the cover the luminous piano sound is worth the price of the disc on its own, but on any level there is a great deal to be enjoyed in this recital. As far as comparisons go, I lined up an online queue of about 20 different Nocturne No. 6s and didn’t find a single one I preferred to Hewitt’s. Just listen to her touch with those harmonic inner notes in the first section, supporting those gorgeous upper and lower lines. This is done while at the same time creating a halo of glowing warmth and helps us forget the expensive edifice of wood, metal and wire used to create such magical sounds.